Now I am the first person to admit that I have had the dreaded "Comparisonitis". I would look at other people's lives and be so envious. They looked so much happier than me and more successful. They were everything I felt like I wasn't. I would constantly be comparing myself to others around me. 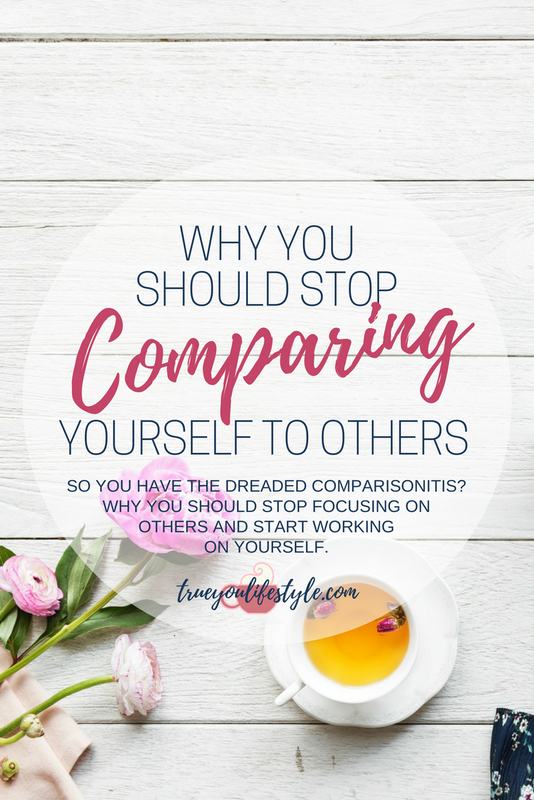 I am still in the process of trying to stop comparing myself and here is what I am learning and telling myself along the way. So first thing we need to do is cleanse who we follow on social media. The biggest source of comparison is on our social media platforms such as Facebook and Instagram. It can be like a poison that we just can't stop ourselves from swallowing. So unfriend the people that are making you feel bad about yourself and start following people that empower and inspire you instead. If you do this and still feel like there is so much out there making you feel down and anxious, consider a complete social media cleanse altogether. Take some time out and focus on yourself. How do you feel after not using social media for this period of time? I guarantee you will feel so much better afterward and you won’t feel like you are missing out on anything. It just needs to be a habit you get out of. You only post the best photos of your most fun days on Instagram. So does everyone else. Apart from the very few, we all want to show off a little using our social media, it's just how we work. So you might be seeing an old friend from school on holiday in Barbados with her super hot boyfriend whilst you are sitting alone eating an entire bag of crisps watching Netflix. But what you might not know is that her boyfriend are only still together because they had this holiday booked and they actually are up to their eyeballs in debt to pay for this vacation. You never truly know what is going on behind closed doors. But then again they might actually be in a really great place and she does have this amazing boyfriend and enough money to afford these luxurious holidays but you don't know the struggles they had to go through to finally get to that level. So just remember no matter how someone's life looks on social media, you are only seeing 1%. Plus its always the best 1%. They have the same struggles just like you. You should not base how you think about yourself on your perception of others. The only competition you want to have is with your past self. You will never win if you keep pitting yourself against others, what joy is that going to bring? You will always, no matter what, find something inferior about yourself if you continue to do this. So focus on yourself, start getting deep into a Self-Love ritual. How can you improve yourself and make your self a better person than yesterday? If you really focus and start putting in the work to turn yourself around and become the best version of yourself you won't have time to worry about others. Once you start to work on yourself you will learn to love yourself more and more. Then at this point, you will have no interest in what other people are doing because you are so focused on how far you have come and what exciting things you have coming up. So you see your friends are starting to buy their own homes and get engaged or even start having kids. So why aren't you? The answer is simple - it isn't your time yet. There are some lessons you need to learn before you get to this stage. And yes it is frustrating feeling like you are so behind with life and that people are really starting theirs and you still feel stuck at home with your parents trying your best to get by. But like always this struggle will teach you something. It will become a lesson that you will apply to your life and when your time comes you will be so much more prepared and ready to make the most of it. You never know, those silly things like the fact you got promoted last year might be the envy of others. Because you are so focused on what you haven't got you actually forget the things you have achieved. And remember, life is not a race. There is no set time or order to do anything. When you are ready it will happen so don't let it dishearten you. What are you putting into action to help you stop feeling inferior to others? Get access to this FREE E-Course if you want to take steps to find your passion and build the life you dream of.